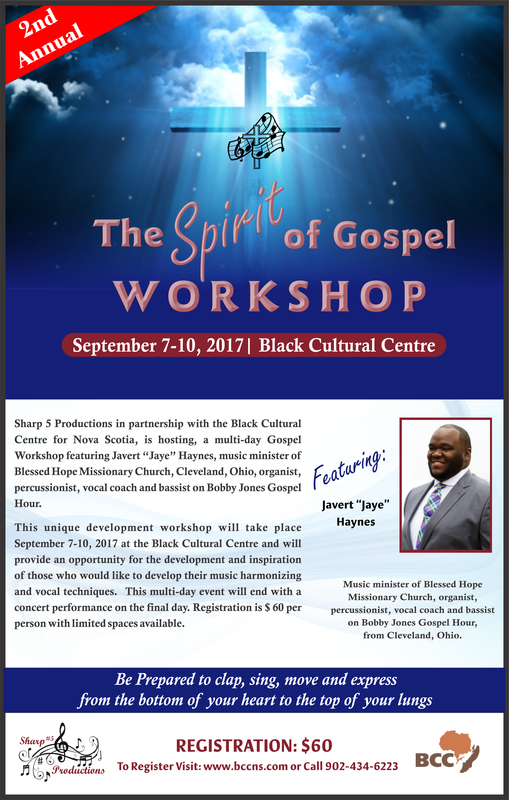 Sharp 5 Productions in partnership with the Black Cultural Centre for Nova Scotia, is hosting, a multi-day Gospel Workshop featuring Javert “Jaye” Haynes, music minister of Blessed Hope Missionary Church, Cleveland, Ohio, organist, percussionist, vocal coach and bassist on Bobby Jones Gospel Hour. For the second year, this unique development workshop will take place September 7-10th, 2017 at the Black Cultural Centre and will provide an opportunity for the development and inspiration of those who would like to develop their music harmonizing and vocal techniques. This multi-day event will end with a concert performance on the final day. Registration is $ 60 per person with limited spaces available.